VIDEO: Fun Thai Slang – It Serves You Right! Below are the translations for the dialogue of the role play in the video: Mod: มิ้งช้าจัง Mink cháa jang. Mink is so late. 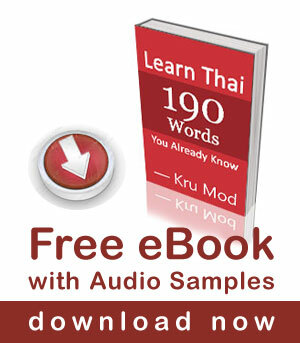 ช้า /cháa/ = slow, late จัง /jang/ = very, used for emphasis at the end of a statement. Mai: เมื่อไหร่จะมาอ่ะ mûea-rài jà maa à? When is he coming? เมื่อไหร่ /mûea-rài/ = When? จะ /jà/ = will, used to from a future … [Read more...] about VIDEO: Fun Thai Slang – It Serves You Right!